Great Charm but…Conventional Fireplaces are 0% efficiency at best. It’s no surprise to anyone that the conventional masonry fireplace basically contributes little or no heat to our homes. In fact when outside temperatures drop below 40 degrees Fahrenheit we experience a net loss of heat when using our fireplace. It is also no surprise that there is no substitute for the charm and atmosphere created by an open fire. That is why Safeside Chimney loves installing Bellfires for our customers, it guarantees a happy repeat client. Our entire surroundings have taken a giant step into the 21st Century except for the familiar fireplace which has virtually remained unchanged for centuries. In the late 1700’s, Benjamin Thompson, Count of Rumford, recognized that a fireplace heats an area by radiation, began a series of experiments aimed at improving its performance. 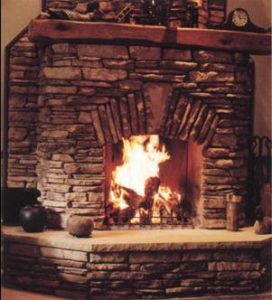 Using the knowledge gained from his studies, Rumford modified the traditional fireplace design into one that burned cleaner and hotter and did not smoke. Later, in the 1900’s, a series of scientific experiments were conducted by Professor Peter 0. Rosin. Dr. Rosin was able to observe air and smoke flow patterns in the definitive laboratory study, and thus developed the ideal firebox and chimney shape for maximum efficiency. The important point of Dr. Rosin’s work is that it was performed in a scientific manner and pointed the way to a much more efficient and functional fireplace. 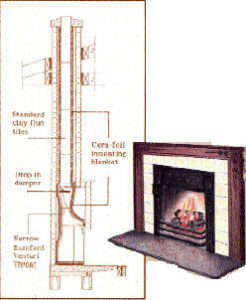 Bell of England took this information and applied it to develop the Bellfire Fireplace, providing the ideal firebox and throat shape to guarantee an efficient fireplace, capable of producing maximum radiant heat with minimum fuel. 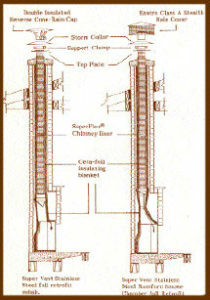 Sleepy Hollow Chimney Supply has optimized the Bellfire designs, and produced a superior radiant firebox combining advanced casting techniques, high temperature, and high alumina ladle cast refractory. Bellfire unitsare the finest heat producing open fireplaces to be found. Whether used to upgrade old metal or masonry fireboxes or in new construction you can experience the Bellfire Advantage, todays thinking in efficient environmentally positive fireplace design. 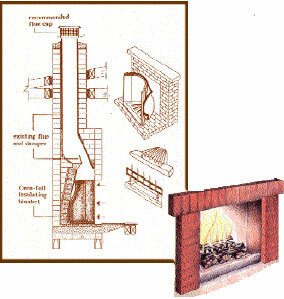 Foundry precast fireplace components insure combustion efficient design and labor-saving time-every time. The firebox and smoke chamber, the heart of your fireplace are constructed in minutes versus days.. From smallVictorian and Kivas, to large Colonial, Contemporary and Castle fireplaces Bellfires has the size for you. Space Age Insulation concentrates heat back into the fire. State of the art high density foil faced ceramic blanket wraps around the entire firebox, under the hearth and surrounds the smoke chamber. This accomplishes two very important things: Supreme safety in the prevention of heat flow into adjacent combustible structures. This heat is re-directed back into the fire achieving complete combustion of wood fuel and maximum radiant heat into your room. Our Refractory is extremely durable and possesses a large thermal mass. (A) Beilfires® Durability: Industrial grade 70% alumnia high temperature re-inforced refractory with stainless steel needles and extra wall thickness makes our firebox virtually indestructible even for the most abusive conditions. emitting from the chimney top are the hallmarks of this design. The Bellfires refractory firebox releases its stored up heat into your living space long after the fire has subsided. These characteristics rival the performance of a masonry heater. The Shape is also part of the secret to thorough combustion of wood. The “Apex’ located on the back wall creates a hot spot that radiates heat back into the fire and out into the room. The “Apex turns the Bellfire into an incinerator and a real home heater. The wood is burned to a light ash, creosote is practically eliminated and the “smelly fireplace syndrome” is also eliminated. Beilfires® Fireplaces vent on 50% smaller diameter flue size than conventional fireplaces = 50% less heat loss escaping up the chimney. Fuel efficiency is increased by 50%. More heat from less wood. Retro fits into an existing masonry or metal firebox, old or new, utilizing the existing damper, smoke chamber and the tile lined flue, without altering the existing facing. This firebox is the basic building block in each of the four types of Bellfire systems. By itself it retrofits into an existing conventional fireplace, transforming it into a real home heater, with dazzling beautiful flames. In two hours you can transform a smoking wood-eating fireplace into an elegant and efficient heater. The Bellfires offer a wide range of sizes, making possible an exact retrofit into your existing fireplace, transforming your fireplace into a dependable secondary heat source. Truly the comforting heart of your home. Fireplaces that heat through convection tend to move warmed air & dust particles to the rooms ceiling, leaving the body and room unevenly warmed. In contrast, the scientific shape of the Bellfires Refractory Firebox provides auniform radiant energy that warms the body on contact as illustrated in figure. costly construction mistakes. 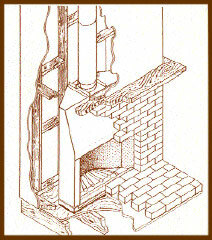 An entire masonry chimney built around the Bellfire firebox and special masonry smoke dome. It is modular so construction is fast and produces an extremely safe, efficient fireplace every time. The same firebox as the above Repair Unit, with the addition of a 4 wide Rumford style Venturi throat design smoke chamber incorporating a refractory rectangular to round transition and an integral patented Bellfires damper. For new construction or renovation work, a fireplace that requires no foundation or footings. Ideal where it would be difficult to install a conventional masonry fireplace. The Bellfire Refractory Firebox, Hearth, side flares, and smoke chamber are enclosed in a heavy 20 guage steel outer shell, ideal for installation in seizmic areas. A fireplace design that utilizes proprietary themal insulation technology and meticulous metal fabrication found nowhere else. This unit can be placed on a wood floor and positioned within 2′ to combustible rear and side walls. The Rumford styled smoke chamber vents into Class “A’ insulated flue. Super radiant heat output and thorough combustion provide ample warmth and fuel efficiency that sets new standards for the open hearth. Our two close clearance fireplaces are available in widths of 26-34″ and 25-33” high. BELLFIRES BURN UP TO 89% CLEANER THAN A TYPICAL FIREPLACE = LESS ENVIRONMENTAL POLLUTION. The repair unit with the addition of a Sleepy Hollow custom design, type 310, 18 gauge refractory stainless steel smoke chamber with integral damper/baffle. Connect the smoke chamber to our insulated round or oval 6, 7, or 8″ diameter Super-Flex flexible stainless steel flue liner. Today many fireplaces do not yield satisfactory results. Many are old or in disrepair. Many do not meet codes of safety clearance to combustibles. Oversized or undersized flues and outside exterior wall construction equal cold and or smokey performance. Many metal heat circulating models are rusted out and dangerous. The fully insulated Super Vent Retrofit system corrects these flaws, transforming your fireplace into a resored super safe high heat fireplace, again, without altering the fireplace facing.